The Greenland Shark is a large shark found in the Northern Atlantic. It is also known as the Grey Shark or Gurry Shark. It is the only true sub-Arctic shark. This species live in cold waters of the North Atlantic around Iceland, Greenland, and Canada year round. The scientific name of this species is Somniosus macrocephalus. This shark is brown, gray and black in color and may have dark lines or white spots. They have 48 to 52 razor sharp teeth and upper teeth are long while its lower teeth are flatter and more closely set. The Greenland Shark is a part of the Sleeper Shark Family. They tend to swim incredibly slowly. During the summer months, these sharks migrate into deeper, colder waters. The water can be as deep as 7200 feet. It has been estimated by scientists that these sharks can live up to approximately 200 years. This long lifespan makes them Earth’s longest-living vertebrates. The first ever underwater photos of a live Greenland shark were taken in the Arctic in 1995. Generally, these sharks do not attack human beings. This species has the most toxic meat of any shark as it contains a high concentration of the neurotoxin trimethylamine oxide. These sharks are commonly parasitized by the copepod Ommatokoita elongata. They are not picky eaters and eat just about any meat it finds, either dead or alive. Declan, Tobin. " Amazing Greenland Shark Facts for Kids ." Easy Science for Kids, Apr 2019. Web. 21 Apr 2019. 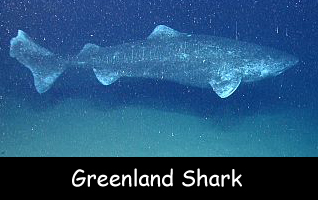 < https://easyscienceforkids.com/greenland-shark/ >.